ate cyclase. This activates the catalytic activity of the adenylate cyclase so that the substrate ATP is converted into the product cAMP + PP; (step 5). Finally, after a short time interval, the quiescent GTPase activity of the activated a-subunit becomes active (step 6) so that the GTP is hydrolyzed to bound GDP and free inorganic phosphate; this effectively turns off the adenylate cyclase activity. Accordingly, the a-subunit returns to its original state in a complex of a, ¡3, and y, as depicted in step 1. The same series of events is followed where a Gj subunit is coupled to the adenylate cyclase, but the end result is reduction in the activity of the adenylate cyclases. The cAMP produced as a consequence of the G-protein activation of adenylate cyclase functions as a second messenger. Second messengers function as intracellular messengers for the primary signaling moiety, the hormone. Table 1-9 tabulates the known second messengers. Cyclic AMP activates protein kinase A (see Figure 1-37). Protein kinase A is a tetramer, comprising two equivalent regulatory subunits (R) and two equivalent catalytic subunits (C); the tetrameric form of protein kinase A is not able to function catalytically. Four molecules of cAMP bind to the two R subunits, which provokes the dissociation of the tetramer into a dimer of regulatory subunits and monomeric free catalytically active C subunits. The liberated C subunits function as an active kinase to phosphorylate proteins, which thereby amplifies the initial hormonal signal within the target cell. There are a large number of proteins that can be phosphorylated by PKA, including enzymes of glycolysis and glycogenolysis, chromatin proteins including histones, and ribosomal proteins. The actions of ACTH and TSH on their target cells in the zona fasciculata of the adrenal cortex and in the thyroid, respectively, which stimulate the release of Cortisol and thyroxine, are known to use the PKA pathway and possibly other pathways. Thus, there is potentially a wide array of cellular constituents where properties can be influenced by the hormonal activation of PKA. 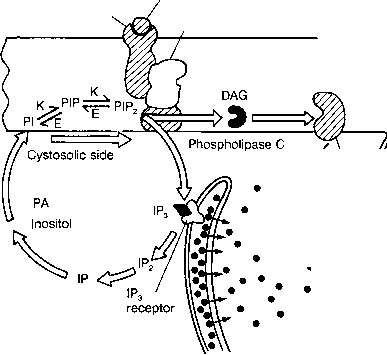 FIGURE 1-39 Overview of the hormonal signaling through the phosphatidylinositol system generating the second messengers, inositol 1,4,5-trisphosphate (IPs), diacylglycerol (DAG), and Ca2+. The action of IP3 is to increase cytoplasmic Ca2+ levels by a receptor-mediated event in the cellular calcium store. Abbreviations: DAG, diacylglycerol; PA, phosphatide acid; IP, inositol phosphate; IP2, inositol diphosphate; IP3, inositol 1,4,5-triphosphate; IP4, inositol 1,3,4,5-tetraphosphate; PIP, phosphatidylinositol phosphate; PIP2, phosphatidylinositol 4,5,-diphosphate; K, kinase; E, esterase. of cGMP, which activates PKG and, in turn, further phosphorylates a subset of cellular proteins, producing the desired biological responses. A second major signal transduction pathway for membrane-bound receptors coupled to G proteins is the IP3 phospholipase C pathway. Here, signal transduction of the ac-subunit results in the activation of a membrane-bound phospholipase C. This enzyme catalyzes the hydrolysis of a membrane-bound substrate phosphatidylinositol 4,5-diphosphate (PIP2) to form two second messengers, diacylglyceride (DAG) and inositol 1,4,5-triphosphate (IP3). Figure 138 shows the structure of the tumor promoter TPA (12-O-tetradecylphorbol 13-acetate). TPA functions as a pharmacological agent for PKC in the same way that forskolin does for PKA, in that it mediates the full activity of PKC and binds directly to the enzyme. The detailed operation of the phospholipase C activation of the phosphatidylinositol (IP3) and diacylglycerol pathways is summarized in Figure 1-39. The second messengers IP3 and DAG each have their own separate spheres of influence. The released IP3 diffuses from the cell membrane to its own receptor located in the endoplasmic reticulum. The IP3 receptor belongs to the class of multiple-membrane-spanning receptors (see Table 1-4) that are coupled to the opening of a Ca2+ channel. 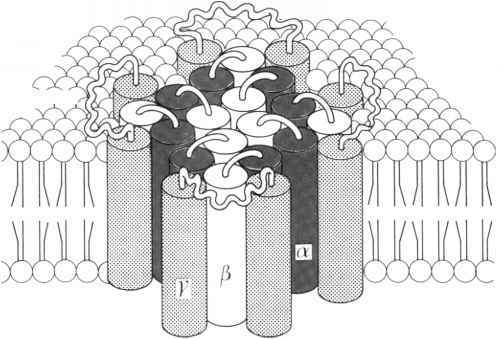 In this instance, the membrane receptor is located on an interior cell membrane and the ion channel communicates across the membrane of the endoplasmic reticulum. 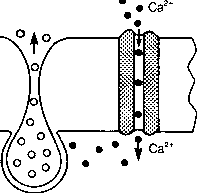 Ca+ ions are sequestered inside the endoplasmic reticulum, and when the IP3 occupies the receptor, the Ca2+ channel opens, releasing the Ca2+ ions and thereby increasing the cytosolic concentration of Ca2+. cytosis, which can explain the Ca2+ secretion coupling mechanism often associated with the secretion of peptide hormones by their secretory glands, e.g., pituitary hormones, insulin. Alternatively, the elevated extracellular Ca2+ may bind to calmodulin. Calmodulin can function as a Ca2+ receptor in the cell and may function to maintain intracellular Ca2+ in the range of 10"7 M. Calmodulin is present in the cytoplasmic compartment of virtually all cells of higher organisms. It binds four Ca2+ ions tightly (Kd ~ 10 8 M) and then undergoes a conformational change so that it interacts with a subset of Ca2+-regulated enzymes, e.g., phosphorylase kinase a and phosphorylase kinase b, which in turn amplify the initiating hormone signal. After IP3 is released from its intracellular membrane receptor, it is metabolized by stepwise removal of the three phosphate groups to generate free inositol. This inositol is conjugated with phosphatidic acid (PA) to yield a membrane-associated phosphatidylinositol (PI). The PI is then phosphorylated twice by a kinase to yield membrane-bound PIP2, which is available to undergo another round of hydrolysis and reformation of the second messengers DAG and IP3. The other second messenger, diacylglycerol (DAG), binds to an allosteric binding site on protein kinase C, which, in the presence of phosphatidylserine and Ca2+, becomes activated so that still another subset of cellular proteins becomes phosphorylated. The enzyme PKC consists of two domains, a catalytic domain and a regulatory domain, which can be separated from one another by site-specific proteolysis. The free catalytic subunit, formerly called protein kinase M, can phos-phorylate substrate proteins independent of the presence of the regulatory subunit. The regulatory subunit domain contains two Zn+ fingers, which are usually considered to be hallmarks of DNA-binding proteins (see the next section); this activity has not yet been demonstrated for PKC. those that are coupled via specific G proteins to a membrane-bound receptor. Thus, the aC- and aK-isoforms, respectively, transduce the opening of a Ca2+ or K+ channel in the outer cell membrane. The ion specificity of a channel is believed to be determined by the amino acid composition and sequence present in the seven-membrane-spanning domain that comprises the channel. Figure 1-40 presents a schematic model of the dihydropyridine-sensitive Ca2+ from skeletal muscle. Steroid hormones, including 1,25-dihydroxy vitamin D3, thyroid hormones, and retinoic acid, generate biological responses primarily by stimulating the synthesis of mRNA at the level of the initiation of gene transcription. Basically their receptors may be considered to be transcription factors. Figure 1-41 summarizes, in a generic fashion, the sequence of steps that ensues after the arrival of the hormone at its target cells, which involves the participation of the receptor. In step 1, the hormone (H) dissociates from the plasma transport protein. In step 2, the hormone enters the target cell by diffusing through the outer cell membrane. Then, depending upon the subcellular localization of the unoccupied receptor (see Table 1-5), the hormone will either interact with the receptor in the cytoplasmic compartment (glucocorticoid and aldosterone receptors) or continue through the cytoplasm and cross the perinuclear membrane to interact with a receptor in the nucleus (thyroid, estrogen, progesterone, retinoic acid, and l,25(OH)2D3 receptors). As discussed earlier, the unoccupied form of the steroid receptor is believed to exist in the cell as a conjugate with a dimer of the 90-kDa heat shock protein (HSP); in Figure 1-41 the HSP dimer is indicated by a pair of ovals. It has been suggested that the HSP's function is to occlude the DNA-binding domain of the receptor (see Figure 1-23), which prevents the unoccupied receptor from binding to DNA.